Reports are beginning to surface that tell a horrifying story of a near miss for the state of Israel. The Palestinians have been using billions in aid money to build their terror tunnel network for a massive attack they started planning 12 years ago! Hamas planned to use the tunnels it dug from Gaza to Israel to execute a massive attack on southern Israel, an Israeli newspaper reported, citing unnamed Israeli security sources. 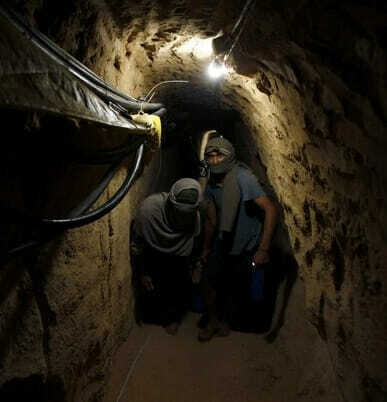 Under the plan detailed Friday by the Hebrew-language Maariv daily, Hamas planned to send terrorists through the more than 30 tunnels uncovered by Israeli troops and into six southern Israeli communities on Rosh Hashanah in September of this year. The plan was to kill and kidnap as many Israelis as possible, according to the report. Israeli Prime Minister Benjamin Netanyahu reportedly told the security Cabinet about the discovered plot during late last week. Among it’s other achievements fighting in Gaza, Israel also captured a few terrorists and was able to extract information about Hamas’s plans. When the soldiers interrogated the terrorists they asked “Why, with so many tunnels (41 so far) going deep into Israel, 25 meters below the ground, some of which reached as far as Beer Sheva – didn’t you use them to attack, kidnap and/or kill Israeli civilians? “We have spend the last 12 years building those tunnels and were planning a massive attack against Israel in 2 months time. We built those dozens of tunnels throughout southern Israel, reaching many towns, not for terror attacks, but to capture territory. It’s also reported that Palestinians used child labor to construct the tunnels, and more than 150 died in the process! According to an article published by the Institute for Palestine Studies, at least 160 children died during the construction of the tunnels. If the timeline is accurate, that means this all started under Mahmoud Abbas, aka Abu Mazen, the so called moderate terrorist leader of the PA. The Obama administration supports the Palestinian Authority and its unity government with Hamas.